"Make these delicious sticky honey-molasses spareribs as spicy as you like with more cayenne pepper in the dry rub." Meanwhile, make the sauce. Combine all ingredients in medium saucepan; bring to a boil over medium-high heat. Reduce heat and simmer 10 minutes until slightly thickened, stirring frequently. Cool to room temperature; cover and refrigerate. 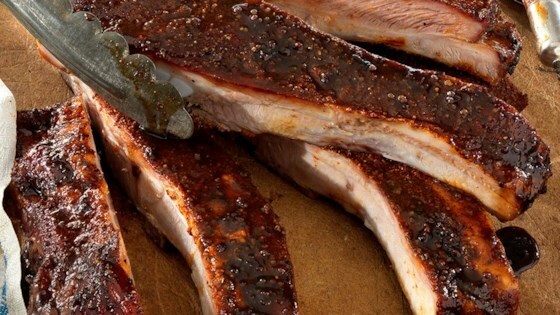 Continue cooking ribs for 1 to 2 hours more over indirect heat, until very tender, spraying with apple juice every 20 to 30 minutes. Add more coals as needed to maintain temperature for a charcoal grill. Serving Suggestions: If you like things with a kick, add a little cayenne to the rub mixture for these finger-lickin' ribs. On the side, go with potato salad, sliced watermelon and plenty of napkins.